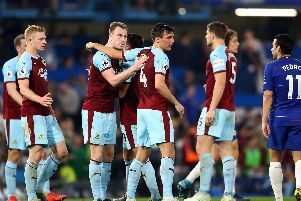 I don’t think many Burnley fans would begrudge “one of their own” Jay Rodriguez scoring on Sunday – providing the Clarets win at Southampton. Especially considering the awful luck the 27-year-old has had with injuries over the last couple of years. But while Rodriguez admits he would be “thrilled” to score, he wouldn’t celebrate out of respect for his former club. In January 2014, Jay-Rod was on target on the only other occasion he has faced his boyhood team, in a 4-3 win for the Saints in an FA Cup tie at St Mary’s. Rodriguez almost looked embarrassed to have had to put the ball in the net. He is back in training following a groin problem, which came on the back of surgery on his foot last season – which followed his recovery from a cruciate ligament tear at Manchester City in April 2014, which came at the peak of his powers, and forced him out of the 2014/15 season, and two Premier League matches against Burnley. And he admitted: “It’s been a very tough time. I’ve been unlucky with a few injuries. The knee is fine now, but I’ve had a run of niggles that have set me back. “I’ve worked hard and kept my head down and hopefully I’ll get a bit of luck and have a good season, that’s my aim. “I’m hoping to be fit for the game. I’ve had a tight groin, but I’ve taken the opportunity to get some rehab with the physio to stop it getting any tighter. “There’s no problem with the scan, I’ve just had a bit of discomfort. “But I feel good and I’m looking forward to it. “There are a lot of games coming up and I’m just trying to get a run of games now. Much has changed since Rodriguez left Turf Moor for £7m in the summer of 2012, but he still keeps an eye out for his former club: “They deserved to be promoted and it was a great feeling, I was so pleased for them to get back - it’s still the first result I look for. “I’m looking forward to it and hopefully I can be involved. “But you have to treat every game as another game. It will be nice to see a few familiar faces, but the squad has changed so much. “Things have moved on and they’ve signed some great players. They all work hard for each other and have a great team spirit. “They’ve started well and I hope they carry on, just not on Sunday!